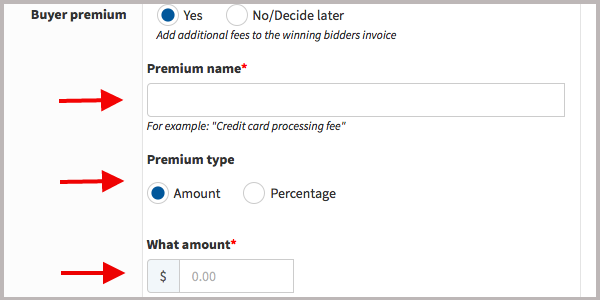 Knowledge Base > Auction How-To’s > How do I add a “Buyers Premium” to my auction? A Buyers Premium is an extra fee you can add to the final invoice that will force the winning bidders to pay. This can be a percentage or a fixed dollar amount. 1) From the Auction Dashboard, click “Edit”. 2) Scroll down until you find “Buyers Premium”. 3) Click “Yes”. You will see an option to enter the “Name” and an “Amount” or “Percentage”. Add a Premium Name – This name will show up on the Invoice and Check Out Page. Amount or Percentage – Choose between a fixed dollar amount or a percentage of the invoice total. Enter Amount – Enter either the Fixed amount or percentage rate you want added at checkout.